I refer to Scary Mary as the one that shows up when you are about to do something that is out of your comfort zone. Sometimes she even brings her mates! Scary Mary will often show herself when you are taking a step into the unknown or doing something that is a leap towards a goal that is for the greater good. Often we play safe and keep on doing things the way we know. We will continue on our journey in a way that is comfortable. If we keep doing the things we are good at, then we don’t get found out by Scary Mary. Conversely, this is generally the time when playing safe is a luxury we can ill afford. Quite often we can find ourselves plunged into change that we hadn’t planned for. And never one to miss an opportunity for a holiday, this will be when Scary Mary turns up with her suitcase. She will bang on for hours and hours about ‘pitfalls’ and ‘shoulds’ until we want to jump into her suitcase and hide. What can be really confusing though is when we really do want to make a leap. And then out of nowhere, we are suddenly overwhelmed with ‘what-ifs’. I can only assume that ‘what if’ is a distant relative of Scary Mary that shows up when she is busy. It is generally the case that the thing that terrifies us the most is the thing that ultimately pushes us on to something better. I say this with confidence as I know that this is certainly the case for me. The phone call we don’t want to make, the meeting we don’t want to go to or the event that we are about to attend – the one that scares the hell out of us. I’m sure you can think of more examples. A fear of failing, looking daft, supposing this happens, supposing no one is interested, I really shouldn’t be doing this, this is absurd and so it goes on. A fear of failure and success in equal measure. At times like this and when we feel this way, it is very hard to imagine what might happen if we just allow ourselves to show up. That we might actually get the gig or stumble upon a true gem. I always work on the logic whenever I am about to do something ‘scary’ that whatever happens there will always be at least one benefit to having just ‘shown up’. I used to be incredibly shy and a roomful of strangers would send me in to a tail spin. And although I do still have a quiver in large groups (small groups are my preferred arrangement), I’ve got it covered now and will always truck up to events, often by myself. I’m sure even the most confident of people have to give themselves a pep talk in the toilet sometimes. I comfort myself with this fact. Don’t get me wrong. I’m also a realist and there are times when the best advice would have been to stay home and wash my hair but these times are generally the exception rather than the rule. One of the biggest examples for me of ‘showing up’ was being dragged along to a business networking event by a dear friend many years ago. To say that I was terrified is an understatement. It was one of those events where I was scared to shake hands with anyone for fear of sweaty palm syndrome whilst at the same time praying that no one would ask me about myself. I stayed terrified during the whole event despite having a great time. And I went again and again. That event was probably one of my defining moments. I met people that day who I consider to be among my closest friends now and I have to say that the people and business owners I have met, and continue to meet through networking, have taught me more than I have ever learned anywhere else. Equally, there is generally always humour around at times of a wobble. This means you get to sit in the loo having a pep talk with yourself while giggling at the same time. It is when we are trying to act normal that we find ourselves doing or saying the most random of things. If you happen to find someone that also finds it funny, you’ve probably got yourself a friend for life. I once went to an interview which involved climbing lots of narrow stairs. So narrow that I had to walk sideways. A bit like a crab. Naturally, I wore my ‘bestest’ high heels. Just as naturally one came off and bonk, bonk, bonked down the stairs in slow motion past the interviewer. 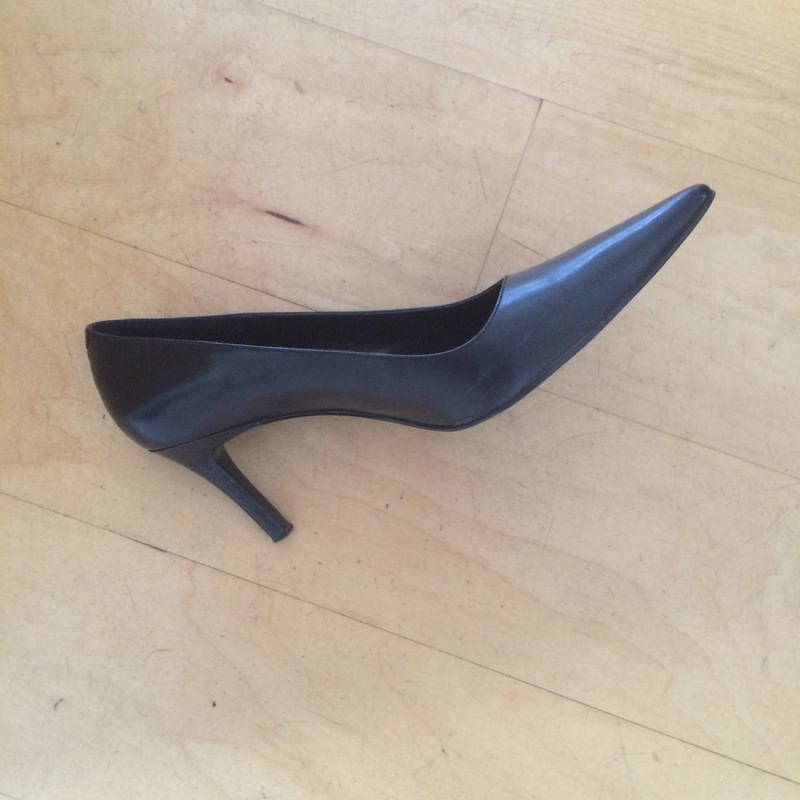 This meant that I very unnaturally had to hop down the stairs in my suit to reclaim the shoe at the bottom of the stairs while trying to make a ‘normal’ conversation about it. That was interesting. I drew the line at making a Cinderella crack. Sometimes you just know that you aren’t the person specified. No amount of over-planning could have prevented that one. There is always an element of fate in our day. And I think sometimes it’s the over-planning that is part of the problem. Because shoes will always be shoes and they are unpredictable. Scary Mary is also unpredictable. She comes and she goes. She will rarely share any wisdom or advice. She will be clean out of ideas and she will certainly never warn you against wearing stilettos. And no matter how fearful I may be, I will always show up. As the great saying goes, if you keep doing what you’re doing, you keep getting what you’re getting. It is so easy to think of reasons why not but it is generally only the reasons why that are worth pursuing. These are the types of conversations that people have with each other all the time. In fact, my daughter expressed concern recently about attending an event. I shared with her the fact that it is quite usual to be a little bit nervy when we are going somewhere new or with people we don’t know. That grown ups feel like that sometimes too. And I would be a bad mother if I didn’t warn her off the stilettos wouldn’t I! Do you glide into new situations naturally and with ease or do you skid in with your shoes glued on and a comforter in your bag? PS No offence if your name is Mary by the way! Continuing with my theme around Celebrating Success and Cheerleading, I am going to be talking to the Make-Up Artist, Alanna Flanders-Doughty. I first met Alanna a few years ago when I participated in a styling makeover which was a collaboration between my hairdresser, a stylist, a photographer and a make-up artist (Alanna). Alanna was just embarking on her journey as a Make-Up Artist (just over 3 years ago) having left behind the security of a full time job. I remember really enjoying hearing about all her plans for work and the various training she had done and would continue to do. I also remember that one of the big challenges she also faced was to learn to drive. That was 3 years ago now and through Social Media, her website and sheer hard graft, I have seen Alanna turn her business into a roaring success. She has worked in magazine and television and has the most amazing portfolio. She is also travelling all around the country in her own wheels! Of course, this success doesn’t come handed on a plate and Alanna has been tireless in her efforts to build a reputation in the industry and this is one of the things I have admired most about her. Alanna, you chose a path into an extremely competitive industry, tell us about how you managed to get a breakthrough? A lot of hard work. When I first started I knew no one in the industry at all. I had to start from scratch. I began by building my portfolio which involves meeting up with a new photographer, model and stylist to get pictures. You are all working together to create some nice images for your portfolio. You have to do this quite a few times to start with to build up enough sets to make a nice portfolio website for yourself. Whist doing this you need to get yourself out there by assisting other established make-up artists to learn how to work in different environments. All these things help you build your profile. It takes time but soon all these people you meet will start offering or putting you forward for jobs. As you can imagine it does take a long time and lot of people aren’t able to make it work. I’ve been very fortune to make it pay off a lot quicker than some, I guess I just really wanted it and knew I could do it. I often see you make references to Make-Up Artist’s being expected to work for nothing in exchange for the prestige of working for a ‘brand’. This is of course a common problem for small businesses. How did you deal with that when you were starting out? I simply said no! The unfortunate thing about these make-up schools is that they aren’t teaching the students the rights and wrongs of this job. So when you leave it’s pretty much up to you. A collaboration is the only thing you should do unpaid, everyone is doing it for pictures and no one is making money from you all working together. When a brand approaches you this is a different story. No matter how new you are you do deserve to be paid. The promises of exposure simply aren’t true. Be true to the industry as accepting these kind of jobs doesn’t help us to move forward. You are worth it. What advice would you give to other small business owners starting out alone? Never give up. Nothing happens over night. It really does take a lot of hard work. You will have knock backs and in the beginning you might feel like you have made the wrong choice but keep going. If you love and enjoy what you are doing, the money will follow. Fortune favours the brave. Oh gosh their have been so many I just enjoy getting up everyday and doing what I love. I’m very lucky. I’ve worked with some celebrities, commercials and at The BAFTAs. It has all been amazing. Who/What keeps you accountable and motivated? I have to get the work myself. No one is going to do that for me. Even when I’m not out on set I am still working from home promoting myself and doing admin. I will still get up and get dressed for work every day. I just knew I could do it. Everything I’ve done in life I have done to the best of my ability. No matter how hard it was in the beginning I knew I could make it work. Going back to my 9-5 desk job just wasn’t an option for me. I was enjoying what I was doing and I wasn’t prepared to give it up. I’m very stubborn and headstrong! You will have seen my recent post about Cheerleaders. Were you lucky enough to have the support of others? If I’m honest, I was surprised about the support I’ve received from some people but this has only made me even more determined to keep going. I think things like this do show you who matters. I am so grateful to those who have shown me support, ‘ve received some lovely messages and compliments from those least expected. My fiancé, mum and dad always tell me how proud of me they are and are amazed of how far I’ve come in this time. Any further goals you want to share? I’ve got a very long list of goals for this year. It’s the first year I’ve actually written them down. They are on my fridge and I look at them everyday. They are really ambitious so I’m hoping I will have a few ticked off soon. As for what they are well I would like to keep that to myself for now! Alanna, thank you so much for taking part this series. It sounds as though you have some exciting plans on your list of goals. It must be a wonderful feeling to be able to look back and reflect on how much you have achieved. I have to say, I’d book you out every day to do my make-up if I could! You can find out more about Alanna’s work on her website. Thank you so much for reading. All comments are welcomed and will be responded to. Continuing with my theme around Celebrating Success and Cheerleading, I am going to be talking to Heather Waring today who has recently launched her new business around walking and transformational walking experiences. The walking experiences focus on providing you wonderful women with space and time to reflect on the life you want to be living – hence ‘Walk to the Rhythm of Your Heart’. I first met Heather at a networking event several years ago when she was working as a Business Coach. She is a woman with many strings to her bow and I find her incredibly warm and engaging. As well as being a brilliant Business Coach, Heather has always had a great passion for walking. One of her pursuits has been walking the Camino de Santiago de Compostella from Le Puy en Velay in Central France. Heather has walked a section every year since 2008 with a fellow walker. What I really love about your story Heather is that you are bringing together your skills and passions and turning this into your work. A perfect combination for success. You must be feeling really excited about sharing this? It’s a really exciting time and so heartening to see it all come together at last. I’ve had many parts of this plan for a long time but a number of issues have stopped it coming together before. One of the biggest issues was myself standing in my way and not allowing my passion for walking and the difference it could make shine through. I believe this is true of many of us women. Our self belief is not always as apparent to ourselves as it is to others. I ran myself into the ground a few years ago through helping everyone else but not myself. Through that recovery, I found out so much about myself. It also enabled me to see very clearly how many other women are the same and how I can help them become the best version of themselves. Walking is my sanity, it allows me time and space and the health benefits are enormous. By knowing my values and then using walking as the vehicle, everything has fallen into place, it’s all aligned with my top values and I get to do what I love with people I love, every day and I get to make a difference too. Your story perfectly encapsulates the message in my recent blog about celebrating success, I talked about how it can be difficult going it alone, getting an idea off the ground and keeping it going. You have done this very well – any cheerleaders? Working for yourself isn’t for everyone as it can be lonely and that’s not something you should ignore. If you need a team, then perhaps working from your kitchen table is not for you. I actually like the space and peace that I get from working on my own but that’s because I have built a number of support systems. For example I am in my 10th year as a member a women’s networking organisation which meets monthly and the women I have got to know there are like a family. These friends are the people I can pick up the phone to which is really important when I’ve had a bad day and need to sound off or get advice. Equally useful when you have something to celebrate and want to share good news. We support each other reciprocally. I have other communities too which provide support and opportunities such as my speaker colleagues and most importantly my Mastermind group. My current Mastermind group consists of 5 women (myself included) and we know each other inside out. We have no need for pretence or anything other than openness and honesty. They are probably my top cheerleaders and I love them to bits. As regards celebrating success, this is one of my big things. In my family it’s any excuse for a celebration and that’s something I encourage, and often insist, my clients do. It doesn’t have to be expensive or take a long time but it does have to be a celebration (however large or small). The first thing I did was to ensure I married a man who knew that freedom was important to me and that I needed my space. I was older when I got married so maybe this helped but it’s really important to know your values and what makes you who you are and then to build from there. You need to honour your values so creating an environment for this to happen is crucial and communication is important. Although I’d always walked, my passion for it started to build at a very difficult time in my life when I was being bullied in the workplace and my daughter was a toddler. I took on many personal walking challenges and when I was training, that walking gave me a break from all that was stressing me. On top of a mountain, life does show you perspective! It’s really important to make time for you and what you love and to find a way to make that happen. I had to be a little selfish, which is a word with so many negative connotations, and something we women find so hard but when your needs are met you are so much more able to help others. I would just encourage you to really strive to do what you want to do, what you need to do and find that balance in the family that allows you to see that through. Everyone will benefit. Don’t be put off, stay strong, you deserve to forge your path. And the inevitable ‘shoulds’ that often stand in the way? ‘Shoulds’ are someone else’s agenda not your own. Just think about it and when you say ‘I should’, see it for what it is. “I should go to the gym” for instance – who says? You don’t want to otherwise you would go so it’s probably you feeling guilty or wondering what others will say if you don’t show. Do you want to? Sometimes we need to cull people in our lives and I would suggest that if there are people we don’t enjoy seeing then it’s time for a cull. By getting rid of some people, we make room for new people who bring us joy. Please don’t think I am absent of ‘should’s’. They crop up in my life but over the years there are a lot less and now, in most cases, I recognise them for what they are. There is a lot of guilt in our lives, this fuels the ‘shoulds’. Changing this isn’t necessarily easy but it can be changed, remember that and next time you find a ‘should’ creeping in, analyse it a little and take appropriate action. Many people reading this will be parents. You’ve been able to do all of this while raising your daughter. That’s not without its challenges is it? Being a mum is one of the hardest jobs and you don’t always get the recognition or the rewards you deserve so living the life you want while being a parent is indeed challenging. I go back to something I said earlier about the kind of man I married, as well as knowing that freedom was important to me, I also needed someone who could be a true partner. From the time our daughter was born, he stepped up to the role being a father. We found our balance which is never a flat surface but always in flux. He travels a great deal so on many occasions it was Ellie and I at home and I felt a little like a single parent (and have great admiration for parents bringing up children on their own). I need my space. It’s finding the way forward that suits you and your situation. It’s give and take. It’s important though to have your voice and make sure it’s heard. This isn’t always easy and at times I had to battle that. You also need wider family or friends that you can depend on to pick up, do a school run, have your child for a sleepover and share the work load with…and also to sit down and open a bottle of wine with. Now our daughter is at University and we have so much freedom but we still plan the times together and the space to do our own things in parallel. The journey never ends, it just changes. Walking is a really popular fitness pursuit. Walking and talking is a wonderful combination. I imagine you have already had a lot of interest. When are you hoping to get started with the sessions? Walking has been called the ‘near perfect’ exercise because of the benefits it brings; because you need little gear to get going and you can do it from your own front door. You can also do it anywhere so it’s an easy form of exercise to fit in when you travel, great for me. Many people find talking about personal issues difficult and this is where walking and talking is so great because when you are walking you don’t have to keep eye contact with the person you walk with and this helps so many people open up. There’s also something about walking in the fresh air that expands your creativity and thinking and I find it so much easier to develop solutions and come up with ideas when walking both for myself and for clients. It also takes you away from the people and the environment that may be causing the stress, overwhelm or trauma in people’s lives and again that makes it easier to get clarity and see the way forward. My transformational walking experiences take women away so that they have time for themselves. Through the walking experiences we exercise every day in a natural environment and learn how to appreciate being in the moment. There will be the support of others as well as time just for you so that you come away feeling clearer, with a plan to make the changes they want and with new friends and support. The first of these weeks away will be happening in May and another in late September/early October. I have also just launched an initiative called Women Walking: Women Talking which is a monthly networking event where women give themselves the gift of a day to walk with others, explore, build relationships and recharge. Heather, thank you so much for sharing. I am so excited for you, I can see this really being a great success. Your story perfectly illustrates many of the points I have raised around success in this series. You have also touched on some very important topics here that helped to shape your direction that I am sure many readers will identify with. I recommend taking a look at Heather’s website where you can read more of her story and find out more details about the walking experiences. Please feel free to comment below if you wish to. All comments are gratefully received and responded to. Next week I shall be talking to another local entrepreneur about her story. Over the last couple of weeks in my blog I have talked about Cheerleaders and Celebrating Success as part of a series and challenge to celebrate International Women’s Day. I also mentioned the fact that we never have to look far for inspirational people and how we are particularly well served in our local area for such people. I am delighted to say that in my blog today I am going to be talking to the lovely Laura Piercy-Farley, the owner of E18 Yoga, about her business. Laura runs Yoga classes for children and adults as well as personal one to one classes and a pregnancy yoga class at the weekend. One of the things that has always struck me about Laura is her energy. I often wonder how many hours there are in Laura’s day compared to everyone else’s. As well as working full-time, Laura is involved in and can turn her hand to so many things. She works full-time in a very demanding role, has two grown up sons and manages to play netball, run Yoga classes, crochet and be very active in the community all at the same time. The biggest surprise is that Laura is due to retire from the City of London police force in June so there is lots more to come for E18 Yoga. It is clear that Laura is passionate about her classes and the children and adults that she teaches. She takes a genuine interest in everyone and the children absolutely love her. Over to you Laura – exciting times ahead, how did the Yoga idea come about? I started attending yoga class with a wonderful lady Kay Russell after a sad event 14 years ago to help me deal with depression. I found it so helpful I wanted to share my good experience with others so I trained for four years, whilst working as a riot officer, to teach others. I have been teaching 12 years (you start teaching half way through your training as a student teacher). My first yoga classes were to my fellow riot officers! I thought if I could teach them I could teach anyone! Yoga has become more and more popular in recent years, it’s a wonderful form of exercise. What would you say are the main benefits? Balance is the main benefit of yoga, exercise is a by product of yoga! Yoga can bring balance to the mind, body, breath and heart. You become stronger, more supple, focused, relaxed and dare I say happier, well at least you do in my classes and we spend a fair amount of time laughing! One of your really successful areas has been working with children. I know that you have seen really positive results? You are an avid user of Social Media sharing lots of useful information around Yoga and well-being. Has this helped with launching your business? I get more enquires via social media than any other medium. I will be launching yoga video bites via Facebook soon watch this space! Another lovely thing about you is that you actively support others with their ventures too. I have talked about Cheerleaders throughout this series. Would you agree that you are one? I like to help local businesses and local yoga teachers, I am a great believer in the rule of three, ‘What you give out free you get back threefold’ . Whilst I am still working I sometimes get offered classes that I can’t cover I look to local teachers to offer them the work. I know that once I retire that this will come back to me. I am also happy to promote business through my class network. Who are your Cheerleaders for when things don’t always go to plan? My biggest cheerleader is my husband. Without his help I would not be able to teach my classes. He cares for our sons, cooks the dinner, walks the dogs, does my accounts, maintains my website and much, much more. He also attends my Monday class with our son and gives me honest feedback. Leaving the security of employment can be life changing but also daunting – has this been a concern for you or is it celebrations all the way? I have loved being a Police Officer and feel very privileged to have completed my full service of 30 years. It is very unusual for a female officer to reach this milestone. I am now ready for the next chapter of my life, spending more time with friends and family, exploring my yoga practice and teaching more yoga!!! Oh and learning the piano, ballroom dancing, Spanish, tennis and the list continues! Up until now, the Yoga has been a part-time business for you. What plans do you have for E18 Yoga once you are officially retired? This was an area of dilemma for me as I like to be busy. I love teaching a variety of yoga class from prenatal all the way through to Fab & Over 50. However, I have decided that my area of expertise is really teaching yoga to children. I am going to offer yoga to schools as an enhancement to the curriculum. Including Inset day training for staff and how they can use yoga to create a calmer more productive class environment and teaching the children how to use yoga to balance their school days. I already teach afterschool yoga club at two schools in South Woodford which I love. Those are the children whose parents see the value of yoga, but there are lots of children in school who would benefit from yoga whose parents would never think to send them, i want them to benefit from yoga as well. I am already in negotiations with a local school to volunteer an hour a week to help children 1-2-1. Fingers crossed. Ben Stansall / 07875 583086 Yoga students practise ‘Downward Facing Dog’ during a yoga class at Wood Street Police Station in the City of London on July 23 2008. Laura, thank you. I really appreciate the time you have taken to share more about the E18 Yoga journey and being part of this series. I wish you all the best with your exciting plans! You can contact Laura and find out more about E18 Yoga here. I hope you have enjoyed reading this as much as I have. As always, your comments are welcomed and encouraged on the blog. Do stop by again next week when I shall be talking to another local entrepreneur.